Currently, there is much concern about changes occurring in the major ice sheets in Greenland and Antarctica (typically thinning and retreat) and their contribution to sea level rise. Unfortunately, recent measurements tend to only span a decade or two, at most, and there is considerable uncertainty about their future response to climate change and the mechanisms which might accelerate ‘deglaciation’. In order to provide a long-term context, Dr Stokes’ project will investigate the disintegration of the North American (Laurentide) Ice Sheet, which was similar in size to the Antarctic ice sheet at the height of the last ‘Ice Age’ around 21,000 years ago, but which had disappeared altogether by around 7,000 years ago. Dr Stokes’ project will focus on when and where the ice sheet experienced ‘streaming flow’, when large, rapidly-flowing glaciers may have discharged lots of ice very quickly. Specifically, the project aims to detect whether there were any episodes of dynamic ‘streaming’ that led to rapid deglaciation, beyond that which might be expected from simply melting the ice sheet from the top down. Dr Stokes will be working on this project with a post-doctoral research associate and co-investigator Professor Chris Clark (University of Sheffield), along with Canadian Partners Lev Tarasov (Memorial University of Newfoundland) and Art Dyke (Memorial University of Newfoundland and Geological Survey of Canada). The above image (click for a larger version) shows a numerical model of the velocity and thickness of the North American Ice Sheet at 18,000 years ago (18ka) and 10,000 years ago (10ka) (from Stokes and Tarasov, 2010: Geophysical Research Letters, 37, L01501). 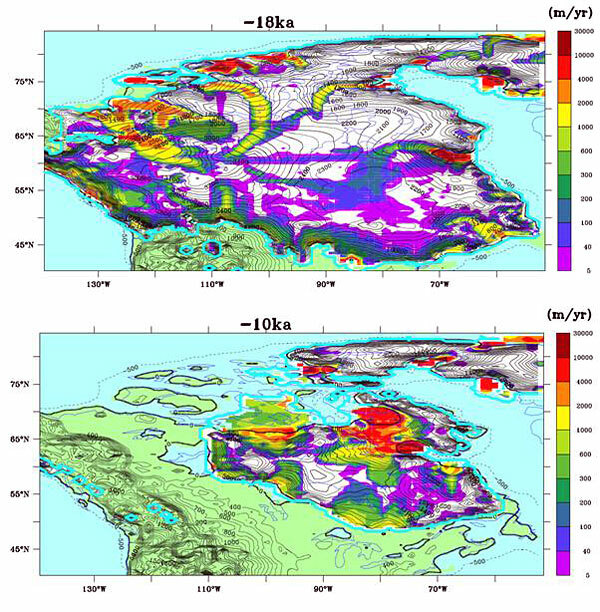 Together with evidence from glacial landforms on the ice sheet bed, results of these modelling experiments will be used to test whether the ice sheet underwent rapid episodes of collapse.